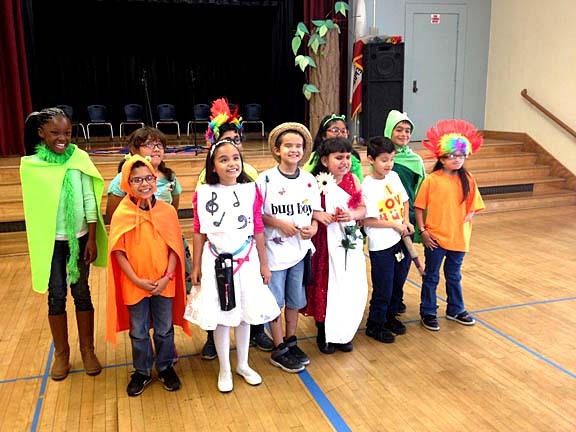 An original production of “Bug Boy: The Musical” was performed in the Van Ness Elementary School auditorium on May 27. The 30-minute show was directed by teacher Anne Bell and performed by students from the Visually Impaired Resource Room. Earlier this year, Van Ness received a grant from the John F. Kennedy Center for the Performing Arts for a song-writing class, which was used to create the musical. GRANT-FINANCED ‘Bug Boy’ debuts at Van Ness School. “We’re so proud of their work,” says Bell, expressing how great it is to “have something of their own that’s such a hit.” Bell works at Van Ness as a teacher for the blind and visually impaired, and described how the children were involved at every stage of the production, from writing the songs, to creating the story and the characters. The story follows Bug Boy and his friends as they resurrect good bugs, take out the poison from plants and teach each other why bugs and plants are useful. Bell explains how the children created the story by combining characters they were already familiar with in class with their own interests and talents as inspiration for each role. The character of Bug Boy, played by Mark Lopez, was born from his interest in entomology, while Natalie Fuentes’ character of Song Girl was inspired by her love of the piano, which she played during the opening. Throughout the show, characters such as Word Girl (Kaehly Estrada), Rovamzalyab (Avi Shadi), Spunky Punks (Wendy Lorenti), and Nature Girl (Hizela Martinez) sang new lyrics set to hit songs. The words to The Beatles classic “All You Need Is Love” were rewritten to “All You Need Are Hugs,” and sung by Hug Boy (Sebastian Espino). The bugs in the show were played by sighted students (Jasmine Contreras, Diego Flores, J’adore Miller and Justin Pelovell), who also helped the cast during scene changes. Van Ness has more than 40 visually impaired and blind students on campus, with the largest such population in Los Angeles. “They have given us more than we could ever give them,” says Iriarte, who is looking to expand the level of integration over the coming years.